Hi everyone! I hope you all had a wonderful Chinese New Year celebration during the holidays but Lunar New Year is still not over yet 😀 Here I’m going to share some recipes with you in the next few posts that I prepared for CNY. 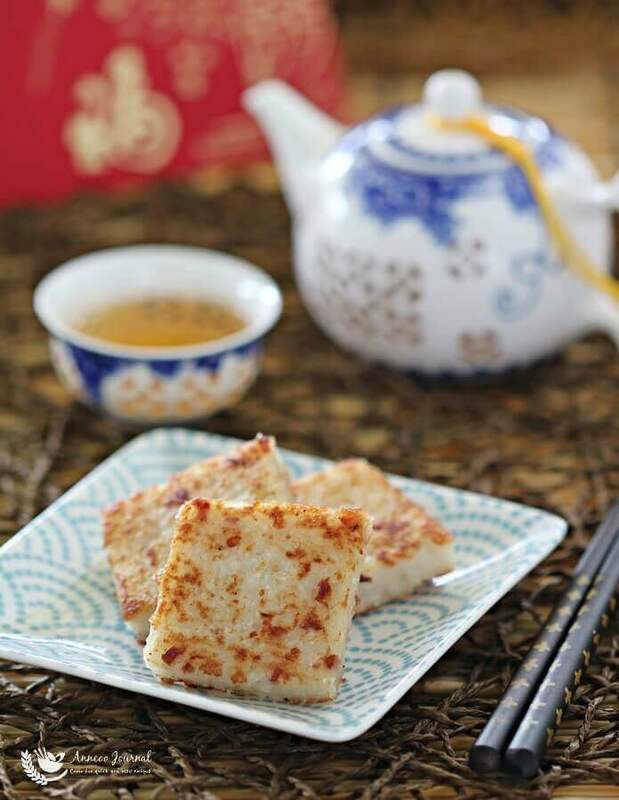 Steamed Radish Cake or turnip cake (蒸萝卜糕) is one of the popular snacks in Chinese dim sum restaurants. I like to make this delicious savory cake for Chinese New Year. It’s easy to make and can be steamed ahead of time (about a week), wrapped with cling wrap and stored it in the refrigerator. 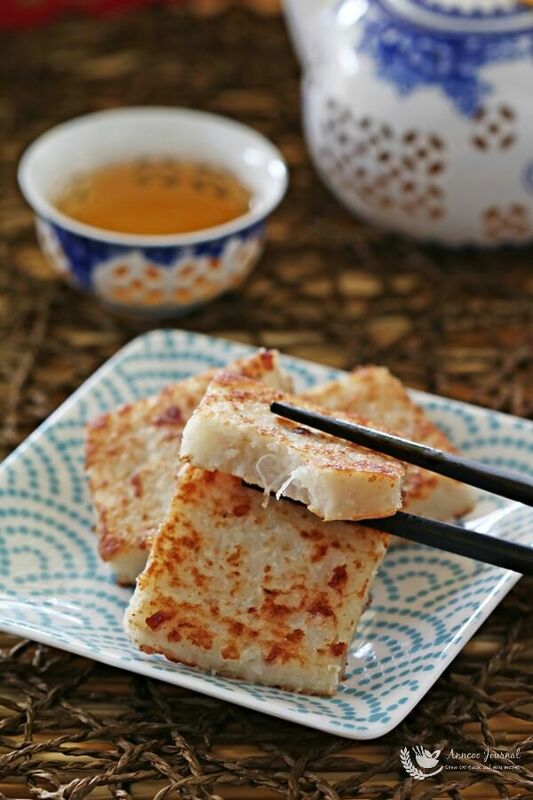 When you are ready to serve it, cut the radish cake into required sizes and pan fry them. Peel skin and grate radish to fine strips and squeeze out excess water and set aside. In a large bowl, combine rice flour, tapioca flour and water together to a flour paste and set aside. Add about 4 tbsp of cooking oil in wok, fry shallot for awhile. Add in sausage, mushrooms and dried shrimp fry till aromatic, add seasoning, fry well again. Then pour all fry ingredients into the boiling water. Bring to boil again and pour water mixture into the flour paste. Use a wooden spoon to stir the flour paste to smooth in the hot water mixture. Then add in the radish in 4 portions and use wooden spoon to separate the radish evenly and stir well. Pour the radish mixture into a 8″ square cake tin greased with oil. Steam at high fire for 35 mins. Leave to cool. 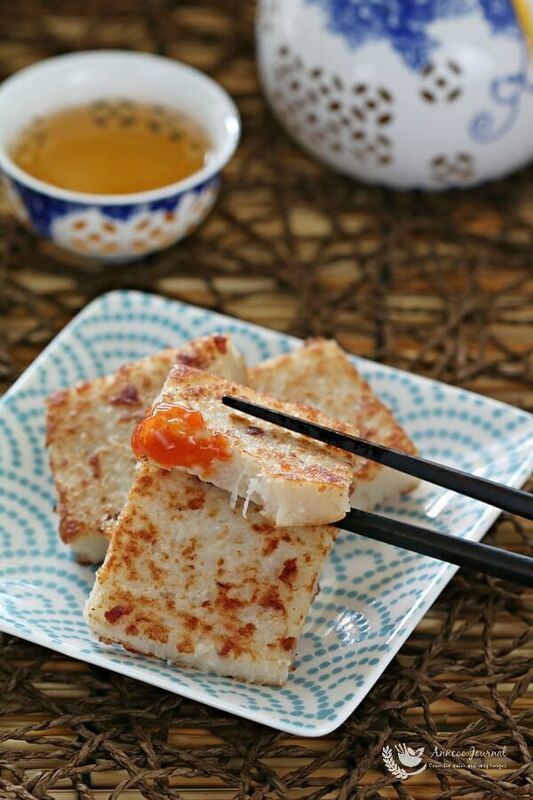 Slice radish cake in pieces and pan fry till golden brown on both sides and serve with chilli sauce. Hi Ann, I tried this recipe this evening and it tastes great. Thank you for sharing this great recipe. Ann, the flour paste mixture is it more solid or more liquid like? Hi Pearly, Yes after mixing the flour and water, the mixture is thick. Then the flour paste will dissolved after pouring in the hot boiling mixture water. very interesting recipe Ann, are these those white radishes, daikons that you used? Hi Nammi, Yes, I used the white radishes. The Japanese daikon is quite expensive. I find that pan seared radish cakes taste BEST after the holiday :-)) They look so inviting! Hi Ann! Gong Xi Fa Cai! I love these radish cakes. So tasty and I can eat a few pieces in one sitting. Maybe one day I will try to make it at home using your recipe.